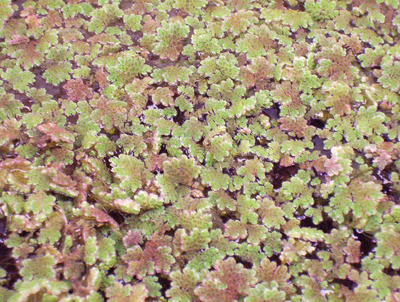 Usually Azolla caroliniana. Small, floating water fern with true roots and crinkled green leaves that change to deep red in strong light. Dorsal lobes of leaf may contain filaments of Anabaena. It is supplied in a 4 oz. jar with care instructions. Size: approximately 1 oz. Note: Not available in Canada.